A lot has been written on “trading mistakes” and the temptation to overtrade. 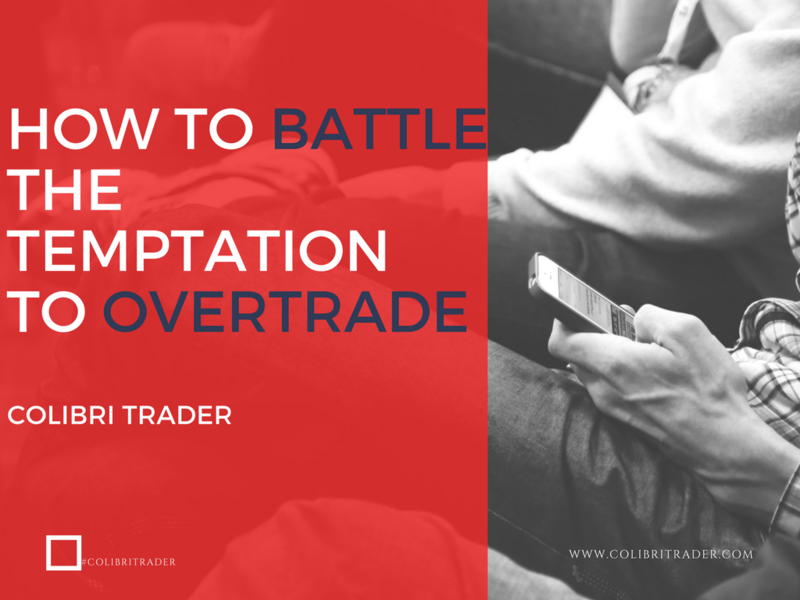 I have not seen a practical advice on how to battle the temptation to overtrade. Most of the sources I have read are just talking about it, but none has so far given me a good way to cope with it. “Overtrading” is every time you place a trade that should not be placed. Overtrading is also every time you go to one (sometimes a few) timeframes below the one that you are usually trading. Let’s say, you use daily timeframes according to your trading strategy. It is every time you are switching down to 15 minutes or 5 minutes and trying to look for scalping opportunities. Overtrading is also looking for opportunities in markets that you usually do not trade. Let’s say you do only trade the major FX pairs. Then, once of a sudden, you realise that there are no trading setups in any of the major currency pairs and you decide to take a long Bond trade because it has just touched major support. “Overtrading” is every time you take a trade that is not according to your plan. The following answer should be taken as just one of the potential ways to battle overtrading. It varies from person to person, but usually these steps help me find better balance and overcome the “sweet temptation” of overtrading. Keep a journal– Start the day with a written statement of what you want to accomplish during this day. I usually wake-up between 5-6 am and start my day with making my first cup of coffee (I admit that my coffee addiction is stronger than me). Then, I sit down and try to concentrate and write down my plan for the day. It’s usually great to include exact figures like how much you want to make this day and how much you are willing to risk if things go wrong. It is important that you are as realistic as possible. Give yourself targets for the day and do not change them no matter what. Define which markets are you going to follow in this day and why you should stay away from other. Try to stay away from high-volatility events like NFP, because they do carry higher risk. Jot down everything that will help you stay on track. These are just a few simple and very effective tools to help you stay in perfect shape. I do also try to do jogging 2-3 times a week. This helps my overall state of being and my endurance. Eat healthy- One of the most important things that will help your overall state of being is what you eat and drink. I try to eat 1-2 times a day. I am not an expert, so please feel free to check with a dietician. It also depends on your personal circumstances, but I have found that skipping breakfast helps me better concentrate. As a coffee drinker, I am having a coffee in the morning and then maybe having something small like an apple or some nuts when I get starving. Then, I am having lunch around midday, which includes a lot of vegetables and meat or fish. At night, I tend to eat very lightly- maybe a small salad or watermelon. In between the meals, I am eating fruits and vegetables, trying to escape fatty and sugary ingredients. Again- do not take my word for granted and check with a dietician, because what is good for me might not be good for you. Regarding drinking- I try not to drink alcohol- especially during the week. I am trying to stay as hydrated as possible and have found that a foldable bottle really helps me achieve that. You can check out this bottle HERE. Stick to your trading plan no matter what– I have written numerous articles on that topic, so will keep it short: just stick to what works and cut everything else. Overtrading should be one of those things. Anyways, check out one of my recent articles on that topic HERE. I am trying to keep my trading as simple as possible and tend to use mostly price action on higher timeframes. If you are interested to know more about my professional trading course, you can check it out HERE or simply e-mail me if you have any questions. Making small changes usually reflects in great results– For this bullet point, I will use a short story. It is a story about a girl throwing starfish into the ocean. “An old man comes along and says to her, “Don’t bother. There’s millions of them out here. You can’t save them. What you’re doing won’t make a difference.” She looks at the starfish in her hand and says, “It makes a difference to this one.” And she throws it into the ocean… Even if the changes you do are tiny, if they are right, they will surely lead to great results. Read books; learn something new every day; improve your knowledge daily– The last bullet point is very straightforward. If you are feeling you are getting bored and are going to “overtrade”, you need to find another activity. I have found reading to be a great way to keep your thoughts away from “overtrading” but still involved with the markets. There are great books on trading out there. You can e-mail me for a full list, but here is an article I wrote about Jesse Livermore and some of his eternal quotes. I also keep an Encyclopaedia handy that I can always learn new and interesting facts about the world we are living in. Sometimes, new information can give you great ideas about self-improvement or trading. Wikipedia is a good source, as well. Last, but not least, is the desire to always stay involved with the markets and improve by other’s experience. This does not mean changing your trading strategy every now and then, but being curious to see another trader’s perspective (especially if he/she is a consistent trader). In the end, the most important way to battle the temptation to overtrade is to be disciplined. It is also crucial to have fun in what you do. If you are getting bored or think that trading will make you rich overnight, you’d better change the field. Be always willing to learn new things and stay open for the world around you. Stay healthy and try to reduce the stress as much as possible by applying strict money management rules. Do not risk more than 1-2% of your capital on each trade. Do not use excessive leverage and most important of all- do not overtrade. Actually after I apply your professional strategy, I seldom check the charts out like I used to. Thanks for the ideas on wellness.